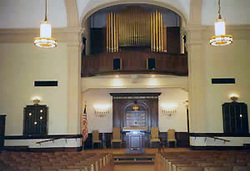 Jewish community life began with Congregation B’nai Israel, which was loosely organized in 1869. By 1870, there were undoubtedly enough Jews in the town to require religious services for weddings, funerals, or the ritual of circumcision. 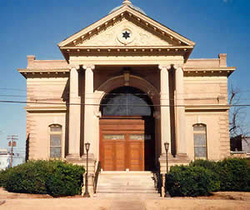 Before the residents of Greenville had a temple, meeting were held at Alexander’s Hall. As Greenville grew, these names began to appear among its most active and influential citizenry: Marx Gunsberger, L. Witkowski, M. Morris, Julius Landau, Theodore Phol, Leon Moyse, Nathan Goldstein, and Jacob Alexander. The Greenville Times reported the first account of a Jewish religious service with the marriage of Pauline Hasburg to Moses Morzinski, conducted by Rabbi Gotthelf of Vicksburg. Eventually, services were conducted under the part-time leadership of Rabbi Charles Rawitzer from Memphis. Rabbi Rawitzer received recognition in the local paper as a “Rabbi” for the first time in 1876. Previous to this time, he was simply noted as the head of the English German School, a nonsectarian school established by Greenville Jews in 1875. In subsequent articles, Rabbi Rawitzer was noted for performing marriages and circumcisions, and the slow progress of his recognition shows the increasing prominence of the Jewish presence in Greenville. 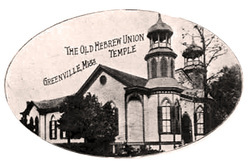 As more Jews moved to Greenville they reorganized and formed Hebrew Union Congregation in 1879. In 1880, they began building the structure for a temple on land given to them by Mrs. Harriet Blanton Theobold, a wealthy local plantation owner. Theobold was a non-Jew, yet her benevolence won her the nickname, “Mother of Greenville.” The building was initially designed to serve primarily as a private school and only secondarily as a worship space. In October of 1881, the Hebrew Union School was formed. In 1881, Rabbi Joseph Bogen was hired to lead the Greenville Congregation, making him the first permanent full-time rabbi. At its inception, M. Morris served as the first president, Nathan Goldstein as the vice president, Theodore Pohl as the secretary, and Herman Wilczinski as the treasurer. The initial board of directors included Jacob Alexander, Morris Weiss, Isaac Isenberg, Leon Moyse, Sol Morris, Simon Hexter, and Nathan Wilczinski. In 1881, Hebrew Union formed a religious schools. Rabbi Bogen soon urged the new congregation to build a proper synagogue for itself. The Ladies Hebrew Union took the lead in this effort, holding a fundraising dance at the local opera house. In 1882, the congregation purchased a lot from two of its members at the corner of Washington and Locust streets. Soon after, the congregation decided to remodel their existing school building into a synagogue rather than build a new structure. The congregation used this converted school building until 1905, when it was moved to Campbell Street and divided into two residences. When Rabbi Bogen left for Texarkana in 1901, Rabbi Abram Brill was hired to lead the congregation. His wife, Edna, was the granddaughter of pioneering community member Nathan Goldstein. Rabbi Brill worked to raise funds for a new building, which was achieved in 1906 for a cost of $30,000. The result was an impressive structure made of brick and stone designed with Grecian Architecture. The striking resemblance between the Temple in Natchez and the Temple in Greenville can be attributed to the fact that they shared the same architect, Harry A. Overbeck. It was placed in the same spot as the former Greenville temple. The new building had a sanctuary, religious school facilities, and a meeting hall. The dedicatory services were held on October 26, 1906. Rabbi Sol Kory of Vicksburg gave the opening prayer. The congregation began using for its prayer book the new Minhag America, authored by the leader of the American Reform movement, Rabbi Isaac Mayer Wise. The Greenville congregation counted among its members Jewish families from surrounding small towns over a wide area. Following Rabbi Brill’s departure in 1911, the congregation had a succession of rabbis before the arrival of Samuel Rabinowitz, who led the congregation for 27 years as rabbi. In 1921, the synagogue hosted Rabbi Michael Aaronson, a World War Vet who voluntary enlisted and became blind while carrying a fellow soldier to safety. Undaunted by his injury, he finished his training at Hebrew Union College and served as a field representative of the Union of American Hebrew Congregations. After Rabbi Rabinowitz left in 1948, the following rabbis served the congregation: Harris Hirschberg; Herbert Hendel; Allan Schwartzman; Jacob Halevi; Abraham Ruderman; Sidney Strome; Stuart Federow; and Sylvan Wolfe. Stanley Relkin was the congregation’s last full-time rabbi. In 1958, Lourene Wells, the Temple’s neighbor, donated a significant piece of her property to them. In 1973 the building was supplemented by a recreational and cultural wing and the Lewis-Lantor Jewish Community Center. Though in 1962 Hebrew Union Congregation boasted the largest congregation in Mississippi with 200 families, today the congregation consists of about 65 families, and shows no signs of resurgence. Nevertheless, the Hebrew Union Congregation continues to be the Jewish center of the Mississippi Delta. The congregation holds services twice a month under the direction of Rabbi Debra Kassoff. In 2013, Debra Kassoff, along with ISJL’s Rabbi Matt Dreffin shaved their heads to raise awareness and funds for research into persistent and pernicious rise in pediatric cancers. In 1991, the congregation received and dedicated a Torah retrieved from a Nazi stockpile of 1564 Torah scrolls after World War II. The scroll was handwritten in 1840 and used by the Milvesko, Czechoslovakia Jewish community until 1940. Most members of the town were deported to Nazi concentration camps. It was restored in London and dedicated to the murdered members of the congregation and other Holocaust victims. In addition to religious activities, Temple members are still quite active in the social scene of Greenville. Beginning in the backyard of the home of Mrs. Nathan Goldstein, Dutch Dinner became an annual Greenville tradition, and was eventually called the annual Corned Beef Deli Luncheon. Temple members prepare enough for about 1600 meals annually. Each year, congregation members organize the Delta Jewish Open, a golf tournament that raises money for such Jewish causes as the Henry S. Jacobs Camp and the Goldring/Woldenberg Institute of Southern Jewish Life. The tournament begins with a ceremonial shofar blast. Although its peak years have passed, the Hebrew Union Congregation continues to be the cornerstone of a historic and significant Jewish community. “Historical Sketch.” Hebrew Union Congregation, Centennial Banquet 1880-1980. Greenville, MS. Greenville, Mississippi file. Institute of Southern Jewish Life archives.